One of the concepts in my theory of Thought Processing is that thoughts are either of value or they are not. If they are not of value, their application is obvious. They ought to be immediately sent into the “recycle bin” and ultimately trashed. If they are value, then they ought not to be dismissed, but given some attention as to where they might best be applied. The thought I wish to express in this entry is definitely of value, for it affirms for me the sanctity of the Artistic-Creative Process. Had something phenomenal not happened this very evening, during a full rewrite of Scene One of Wintone Greene, I would not be placing the words of this thought on this page tonight. It has to do with the creative process. 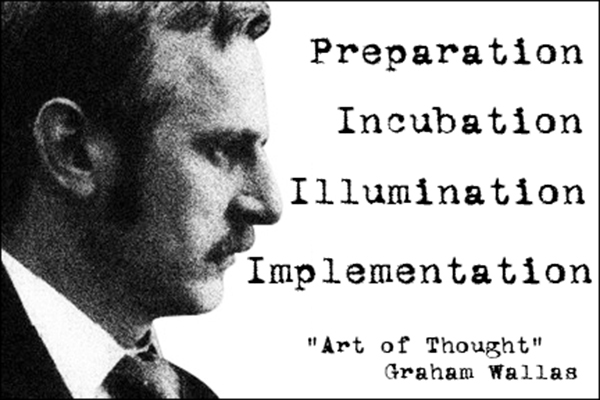 It has to do with the phenomenon of incubation, as introduced by Graham Wallas in his famous treatise, The Art of Thought. 1. I knew that there had to be more evidence of “police brutality” in the scene, as well as more evidence of a naively idealistic spirituality on the part of the Street Kids — the main followers of Winston Greene. I knew that there needed to be a climactic moment in the scene where the Street Kids and the cops would be at odds with each other. But I didn’t know where that moment should be. 2. I knew that in the music of the Opening Number, Intervention, there was a certain spot that seemed extremely anticlimactic. I also knew that the Kids and the Cops were singing toward each other at the moment of said anticlimax. But I didn’t know what to do about it. How intriguing that the two were solved at once, as though they had been intended for each other! In a rush, I added about 24 measures of increasingly dynamic music and lyrics, to expand the interaction between the Kids and the Cops in such a way that what was once musically anticlimactic was now a musical pinnacle, and what was once textually incomplete was now full, rich, and powerful. The music built up and up, the lyrics of transcendent wisdom from the East blossoming into a mantra of liberty, while the vulgar threats of the unenlightened police rose up to meet inspiration with fury. Only Winston Greene had the wisdom and courage to intervene, and to offer himself willfully to the Powers That Be, in order for his finest followers to be spared. I guess you’d have had to have been there. But the upshot is that a relatively lackluster Opening Number has this day been transformed into a profound and powerful affirmation of faith. Truly delightful reading your post. Thank you for sharing and your visit on my blog. My apologies for neglecting to reply to this comment earlier. I’m only now in the process of tidying up my web site. I just looked at quite a few of your paintings. They really are outstanding! Would you call that “impressionism? I’m reminded of Van Gogh – but you probably hear things like that all the time. I’m a bearer of little brains when it comes to the Fine Arts. I’ve been more involved with certain aspects of the Performing Arts. But I’ll definitely try to stay in tune with your paintings and your posts. Thank you for stopping by, and for linking to my site on your page.